Farmers markets are one of the little-known gems of the Big Island of Hawaii. They are spread over the whole island and with only a little planning you can stop by one for breakfast, lunch or souvenir shopping on your itinerary around the island. Most farmers markets are only open on one or two days of the week, but there are enough markets on the Big Island to make visiting one easy without compromising your itinerary. At the farmers markets you can find locally grown healthy produce, freshly prepared food (breakfast and lunch) and buy handmade souvenirs to take home. Also important: by buying directly from the farmer you cut out the middle man and help to strengthen the local community! On this map you can see the location of all farmers markets described on this page. These markets are also described more in-depth further down this page. Farmers markets in and around Kailua Kona and Captain Cook (south of Kona). See our dedicated page on the 7 farmers markets in the Kona district for a more in-depth description (including pictures) of these farmers markets. More information: Pictures, directions and more info on the Kona village farmers market. Formerly known as the South Kona green market. More information: more information and directions for the Pure Kona green market. Farmers markets in and around Hilo. The Laupahoehoe farmers market is halfway between Hilo and Waimea, the market @ the mill is halfway between Hilo and Volcano. 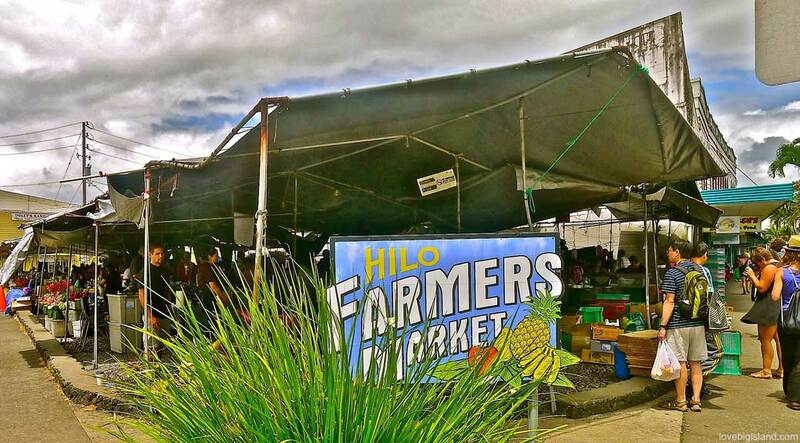 We also provide a more in-depth description of the 6 most popular Hilo farmers markets here. At the end of highway 137 where the 1990 lava flow covered the majority of the Kalapana village and the famous Kaimū Black Sand Beach. Directions: 12-5038 Kalapana Kapoho Beach Rd, Pāhoa, HI 96778. Wednesday between 5:00 PM and 9:00 PM (website) for the night market, also known as the “Wednesday Night Ho’olaule’a Market”. Saturday between 8:00 AM and noon for Uncles Kaimū Farmers Market, (website) . More information: The venue for the farmers market (Uncles ‘Awa Club) is also opened daily from 7:00 AM on. There is a smoothie shack and ‘Uncles Kitchen’ which serves BBQ plates, local style food plates, burgers, appetizers, and fresh fish burgers or plates from 11 am till 7 pm. Uncles ‘Awa Bar is open from 10 am till closing (website). The Hakalau Farmers market is a small market that is located on the terrains of the Botanical World Adventures. More information: at the Hakalau farmers market website. Farmers markets near and in Volcano Village. The Ka’u farmers market is on the road between Kona and Volcano. Paradise meadows is a 75 acre farm close to the most southern point of the USA. Their farm stand is open 7 days a week from 9 AM – 5:30 PM where you can get free samples of the products in sale and also get enjoy a brief tour of the farm. More information: on the Paradise Meadows website. 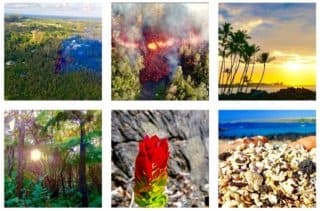 Farmers markets in and around Waimea on the Big Island including one in Hawi (north of Waimea) and Waikoloa (between Waimea and Kona). We have dedicated a spacial page on the 4 most popular farmers markets in Waimea (market days: Saturday and Wednesday) where you can a more in-depth description and photos. 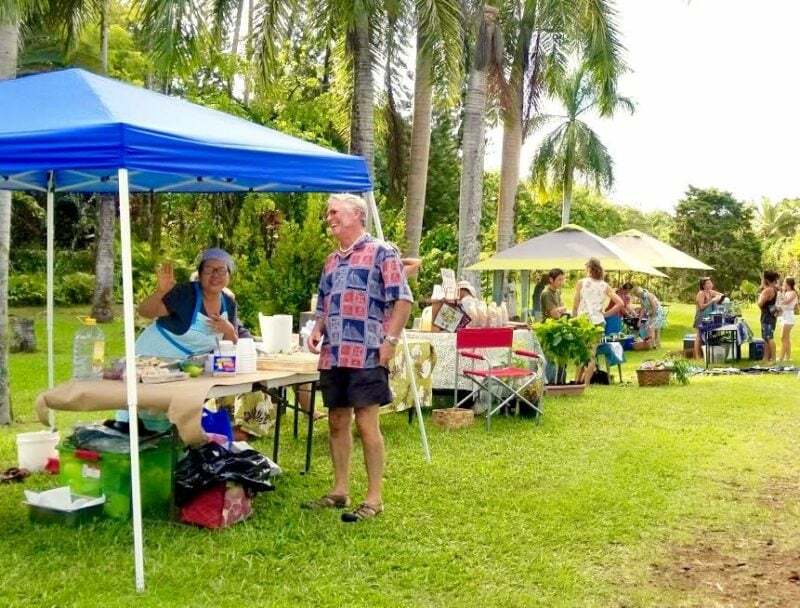 The Sunday Farmers’ Market at Hāmākua Harvest offers only locally produced goods, ono food, live music and a free educational event weekly. Drink a coconut, buy a t-shirt and experience the warm hospitality of Hamakua. SNAP/EBT welcome! More information: Email [email protected] or go this farmers’ market website for more information. Overview of the stands at the Sunday Farmers’ Market at Hāmākua Harvest. Image credit: the Farmers market at Hamakua Harvest. More information: Call 1-808-345-4956 or go here to get an impression of the waikoloa village farmers market. More information: The Kings’ Shops weekly Farmers Market is held throughout the center and features local produce, crafts and freshly made pastries and jams. More information at the ‘weekly events’ section of the kingsshops website. Directions: Under the banyan trees in the heart of Hawi, corner of Akoni Pule (Hwy 270) and Hawi Rd (to Waimea). More information: Read more about this farmers market on Hawi famers market website.